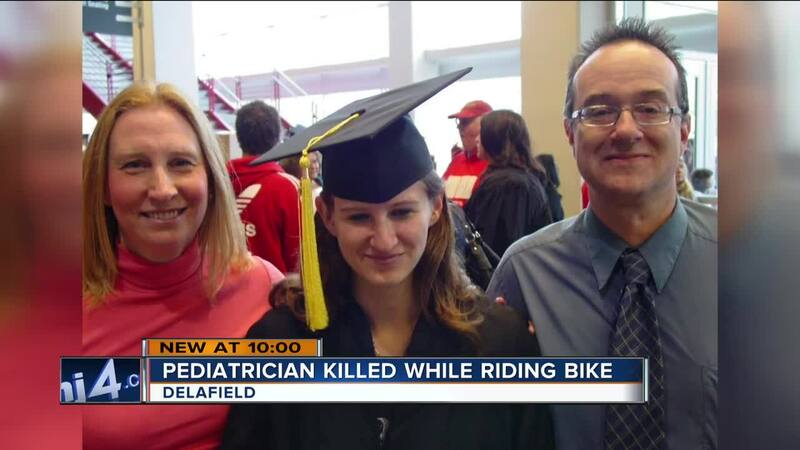 A beloved pediatrician known to many in the Waukesha County area died last Thursday while riding his bike in Delafield. Dr. Brian Yagoda, 57, was riding in the area of Golf Road and Maple Avenue in the early evening when a 71-year-old driver heading the same direction struck him, according to the Waukesha County Sheriff's Department. But it's his work as a doctor that so many will remember him by, including 14-year-old Lizzy Severson, who started seeing Yagoda about four years ago. At the time, her mother Jamie says they didn't have a lot of answers about what was causing Lizzy's illnesses. "He was our saving grace for Elizabeth," Jamie said. "As soon as he got the results back, there was a seminar and he went and enrolled himself in this seminar so he could learn more about it and be able to treat her." Over the years, the Severson family became more than just patients, spending a lot of time with the Yagoda family. "We were just over at their house the Sunday before he passed and we did dinner over there," said Jamie. "[My son] loved playing basketball with Dr. Yagoda." Jamie says she found out about his accident on social media, and couldn't believe it was real. "It's not fair, but everything happens for a reason," she said. "Someone needed him a little bit more than the rest of us did." Yagoda leaves behind three children, and his wife Shirley. "The love between the two of them was just something that you would forever want," said Jamie. At work, Dr. Yagoda was known for his colorful ties, and his humor, even in tough situations. "Just a great person," said Lizzy. "Could make me laugh even when I came in sick. I hadn't smiled in three days, just could make me laugh." Jamie says there won't be a day they don't remember Dr. Yagoda and the impact he left on their family and so many others. "A lifesaver to many," she said. "A hero." In addition to being an organ donor, Yagoda's family hopes in his death, he will save even more lives. They are raising money to pave the gravel shoulder of the road he was riding on that day, so other bicyclists will have a safe place to ride. In lieu of flowers, the family asks donations be made to that cause at Waukesha State Bank, by referencing the Brian Yagoda Memorial Fund.